Ginjer’s books, most of which are part of the Penguin Young Readers series, have sold a combined total of more than 3 million copies worldwide. Her books Freak Out! and Gross Out! were on Publisher’s Weekly’s 2006 and 2007 lists of top 100 best-selling children’s books. Her books have been favorably reviewed in Booklist, Horn Book, School Library Journal, Children’s Literature, and regional newspapers and magazines, and are featured in Scholastic Book Fairs. Her book Platypus! (Random House Step into Reading) was awarded the Maryland Library Association’s 2005 Blue Crab Young Reader Award for Nonfiction and was selected by the National Science Teachers Association as recommended classroom reading. 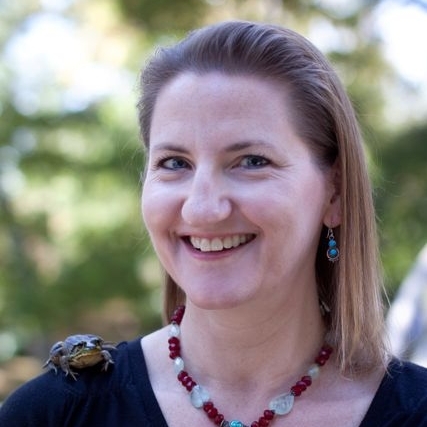 Ginjer is an experienced and lively school, library, and conference presenter, who has appeared at more than 200 elementary schools, regional reading and writing conferences, statewide book festivals, many bookstores and libraries, and even a zoo. She is a graduate of James Madison University and lives in Richmond, Virginia, with her husband, young son, and several silly pets. Ginjer L. Clarke writes fun, fact-filled nonfiction beginning readers about weird, wonderful animals. Her love for strange creatures started early, as the first story she remembers writing in the third grade was “The Strange Animal” about a small, pink-spotted imaginary creature called a Woofa. She loves that her job entails visiting zoos and aquariums, reading lots of books, and even watching TV for research. And she can work at home in her pajamas, which is a lifelong dream! She brings a passion for reading, writing, and learning to all of her books and to her author visits at schools and libraries.